Welcome to Ressurectio et Vita. You can find my blog at apologus.wordpress.com. 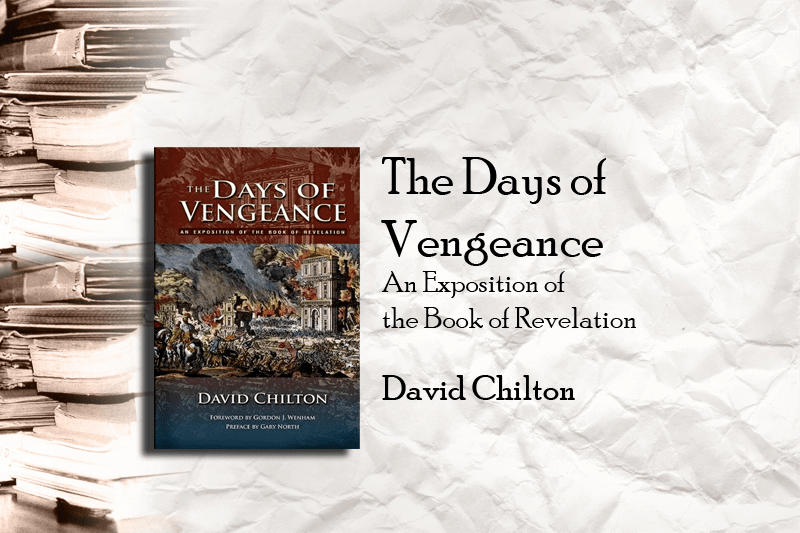 I have been tweeting about doing a series of posts on David Chilton’s commentary on Revelation called Days of Vengeance. Chilton died in 1997, but Gary North put out another edition in 2007, which includes a lengthy preface by North himself on the history of the book, and an introduction to postmillennial thinking. North claims that Chilton’s commentary in many ways began this modern revival of biblical optimism. The preface is worth the read. At the heart of Chilton’s exposition is his premise that the book of Revelation teaches that Christians will overcome all opposition through the work Jesus Christ. It is certainly filled with all sorts of mysteries; mysteries, which even the great expositor John Calvin did not dare to tackle, but central to it is the victory of Jesus’ kingdom on earth before the Second Coming. First, that Revelation is the most Biblical book in the Bible. That is, it is bathed in Old Testament quotations. And because it is so rich with Old Testament theology, one can only begin to understand the book when he knows the Bible well. Second, Revelation has a system of symbolism. In fact, it contains a particular language. The goal for the interpreter is to learn this language. Symbols in Revelation are not disconnected from the rest of Scriptures, but rather fully dependent on the Hebrew Scriptures. Third, Revelation is about imminent events. If one accepts this premise, it will un-do virtually the entire evangelical eschatology industry. Revelation has primarily in mind those events in the first century; specifically, the destruction of the Temple in AD 70. Fourth, Revelation is a worship service. The worship of God, says Chilton, “is central to everything in life.” So, Revelation is highly ecclesiastical and liturgical. Finally, Revelation is a book about dominion. Revelation is not about the terror of anti-Christ, but about the glory of Jesus Christ; He is the beginning and the end; the victory and Lord of all creation. Revelation spells victory for those united to the Son of God. For those new to David Chilton’s Revelation commentary, I welcome you to this journey. Chilton argues that the Bible is more than a mere textbook, but it is a life-changing story about a King whose kingdom will endure forever. Feel free to comment on the blog, and we will delve into the Introduction in the coming days. Pick up and read! This entry was posted in Book Reviews, Revelation, YOUTUBE VIDEO. Bookmark the permalink. This ought to be fun. Thanks for doing this, Uri. You are quite welcome. Spread the word. I would love to persuade at least five people to download or purchase Chilton’s commentary. I own a copy of the book, however, I cannot find the I.C.E. free books, at least not the way it was. Where can I get a free pdf version of “Christian Reconstruction: What It Is-What It Is Not”? I have a friend who’s interested. I am in a Bible study on Revelation currently and I’m using Chilton’s commentary. Chilton’s intro taught me alot itself, and is worth the price of the book. Chilton was a good writer and the commentary is very readable, which is another plus. Kerry, I starting a study with a few men of my congregation on Jim Jordan’s 204 lectures through Revelation, which is a great follow-up to Chilton’s work. I actually have a subscription to Jordan’s lectures on WordMP3, but haven’t listened to many of the Revelation lectures. I’ll have to spend more time with those. Thanks, Jack. I hope to continue my series this coming month.